All age community!! Immaculate and ready to move into!! Adorable 1/1 1/2 . Large living room/ dining room. Kitchen has updated cabinets, granite and stainless appliances. Bathroom has been updated. The half bath has been converted to a laundry room with stacked washer/dryer and laundry tub. Large master bedroom has walk in closet. Very large patio looks on to the shuffleboard court and has roll down hurricane shutters. Community has lots of amenities. Enclave Sandpiper: NICE INVESTMENT PROPERTY WITH GOOD TENANTS PAYING 1225.00 A MONTH. UNIT IS IN VERY NICE CONDITION. TILES THROUGHOUT, FRESHLY PAINTED, NICE KITCHEN CABINETS. GREAT INVESTMENT PROPERTY. Enclave Sandpiper: JUST FEETS FROM THE INTRACOASTAL IN THE HEART OF LANTANA AND MINUTES FROM THE BEACHES. 2 BED AND 2 BATH WITH CERAMIC TILE FLOORS TROUGHOUT AND UPGRADED BATHROOMS AND APPLIANCES. WASHER AND DRYER HOOKS. COME VIEW THIS BEATIFUL HOME. GREAT INVESTMENT OPPORTUNITY. Top floor unit, renovated, mint condition. 28 apts, elevator build. Kitch: SS applncs/dble SS sink/wood cabs/beautiful wood ceiling! Screened balcony apt width/intracoastal view. Large master w/ceiling mouldings, fits king bed, 2 N/S, plus bdrm furniture. Has jumbo 9' X 6' walk-in! Elegant laminate wood floors throughout, matching base boards/door frames. Hurricane windows. Balcony has high-end roll-ups. Laundry rm conveniently on same floor. Water, premium cable included. Allowed to rent 2 times/year. One bedroom convertible. Leave "L" area as-is for a contemporary "open floor plan"; or close it off and create an 15X11 2nd bedroom with wall to wall closet. Beautiful grounds! Community pool and tennis. For boat captain, storage yard next door! Just call, and walk to your awaiting craft! Beautiful and bright 2/1.5 in the Intercoastal community of Waterway Club! Unit features an updated kitchen with granite counters and stainless steel appliances, Laminate floors, Large screened balcony. Great location! just steps away from the Intracoastal and minutes from Downtown Lake Worth restaurants and shops.NO AGE RESTRICTIONS! Must See! Moorings At Lantana: First floor 1/1 garden view condominium featuring 10' high ceilings, open floor plan, convenient location to building entry and garage, newer air conditioner and in unit washer/dryer. Pet friendly Moorings allows cats and small dogs. The complex is situated on the Intracoastal and has it's own Marina (run by Sun-Tex), two pools, clubroom, conference room, gym, valet and 24 hour security. INVESTMENT OPPORTUNITY! Just rented so gain extra rental income throughout the year. Amazing 1st floor condo located at Hidden Harbour of the Palm Beaches in Lantana! View the intercoastal and lagoon from your back patio. Steps to the pool! Marble tile floors sparkle throughout this immaculate condo. Owner kept this condo in pristine condition, clean as a whistle! 2 bedroom 2 bath with great view of the pool in this wonderful gated, pet friendly community. Just 4 minutes from the beach and across the lawn from the Intracoastal waterway. Ceiling fans in every room, newer refrigerator and oven 2016, washer & dryer 2013, hot water heater 2012 and hurricane accordion shutters March 2014. Exterior maintenance and water is included in maintenance fee. Don't miss out on this one. Nicely updated 2 bedroom/2 bath condo in the gated intracoastal community of Hidden Harbour. Updated kitchen with newer appliances and raised ceiling. Features include an upgraded wood parquet floor in the main living area and bedrooms, with tile floor in the kitchen, hallway, and bathrooms. New 2017 central A/C unit. Updated bathrooms. Large covered screened patio facing North, overlooking the historic South Palm Park neighborhood, and view of the intracoastal towards the Northeast. New storm door on the front of the unit. New full glass door in master bedroom provides a view toward the intracoastal. Washer/dryer inside the unit. Community features a pool, and clubhouse with sauna, exercise room, library, and game room. Just minutes from downtown Lantana or Lake Worth, and beaches. Moorings At Lantana: Enjoy living in this resort style community with amenities that include 2 pools, 2 hot tubs, fitness center, club house with games room and outside patio looking onto marina and Intracoastal, valet, garage parking and security in this high floor condo. Priced to sell!! Rarely lived in and never leased. Original owenr. Granite countertops, open floor plan, balcony overlooking courtyard pool and spa area. Condo conveniently located close to garage parking and elevator The Moorings is located close to restaurants and less than 1 1/2 miles to the beach! Won't last. Call to see now! Moorings At Lantana: Great 1 Bedroom in an upscale community on the intracoastal. Granite and marble countertops, Stainless steel appliances & Italian tile & new Berber carpeting. A great investment with amenities galore. Valet parking, 2 heated pools and whirlpools, state-of-the-art Fitness Ctr, media room, Billiards lounge plus more. Great location over pool facing east. 15 minutes from West Palm Beach airport, CityPlace, Delray Beach and 20 minutes to East Boca Raton. Great intracoastal views from this charming 1 bedroom 1 bath, that has an upgraded ''sleeper'' den / office. Master bedroom has separate entrance to the spacious balcony. Tile and wood floors, Stacked washer / dryer, and much more. Walk-in closet, and easy to use accordion storm shutters. Amazing well kept Tennis courts, Pool, Clubhouse, shuffleboard, exercise room, and much more. Come and enjoy all that Hidden Harbour has to offer. Moorings At Lantana: This is well kept turnkey unit, just bring your toothbrush! All European style furniture, light unit, located near elevator on 3rd floor. Living like in Provence in Palm Beach, This unit is just above Wine and Cheese restaurant with great food just , step in and enjoy! Good investment too. Minimum 30 days rentals, 12 times a year. Must see unit! Quick closing! Moorings At Lantana: Immaculate 2/2 condo located at the elegant development of the Moorings. Resort living at this intracoastal community with 2-heated pools, well-equipped fitness center, saunas/steam room, billards, club room, and 24-hr security. On-site management keeps the community meticulous. Boat docks available through marina. This spacious condo has impact windows, split bedrooms, S/S appliances and granite. Ready to move right in. Perfect layout! Great investment property, second home getaway or perfect for the boater looking for a home base with dockage. Incredible value! Well built by Lennar in 2005. Close to beaches, downtown Lake Worth and great restaurants. Also easy commute to downtown West Palm Beach or Palm Beach Int'l Airport. Florida Resort Living at an affordable price! Top floor unit with Intracostal view to south and north. 2 Br and 2 bth unit with washer and dryer in the unit. Fully furnished, just move in. Community has pool, clubhouse, tennis billiard and location is near downtown Lake Worth and Lantana and both beaches. 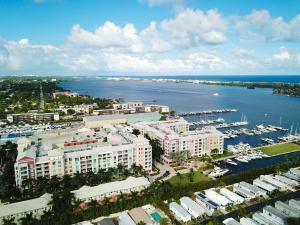 Moorings At Lantana: Enjoy views of boats, marina, intracoastal and the islands beyond from this comfortable Moorings waterfront building one bedroom condo with an open floor plan. The condo features 9' ceilings, full-size washer/dryer in the unit, granite counters in the kitchen along with glass backspash. Condo comes with one assigned garage parking space. Unit is available to be rented right away by new owner with 30 day minimum rentals. Up to two small dogs allowed for unit owners. The Moorings has two pools, hot tubs, marina, gym, conference room, club room, 24 hour security, Cheese and Wine Cafe, and valet. Dining Area hanging light does not convey. Some furniture is negotiable. Moorings At Lantana: Come enjoy spectacular water views of Florida intracoastal waterways from this spacious 1/1 condo! 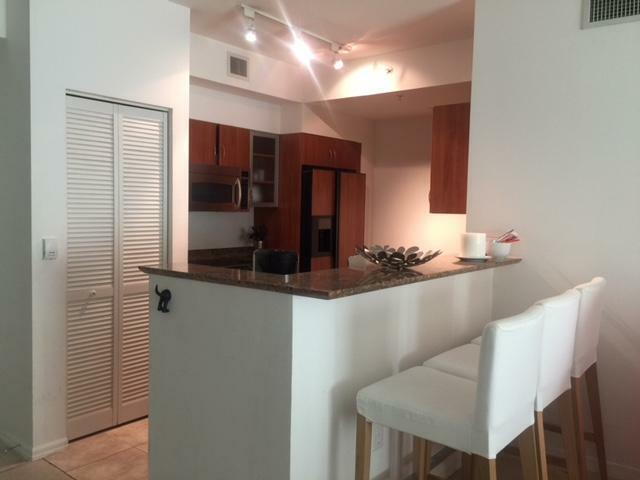 This penthouse unit features dark laminate wood floors through out entire unit, Spacious modern kitchen with granite countertop, tile backsplash, GE Profile appliances, large stainless steel sink, New washer and dryer, and much much more! This Resort style community features Valet service, 2 Pools (1 is waterfront) full service marina on site, management office on site, 24hr security, Full service gym, sauna, clubroom, and so much more! call today to view! Pet friendly building allows cats and small dogs. Maintenance fee includes water, basic cable, high speed internet, and exterior insurance. Island Towers: One of the best locations in Lantana, Florida. Located in the intra-coastal community of Island Towers that is cozy and quaint. This corner unit is on the 2nd floor, walking distance to the intra-coastal. Condo has 2 bedrooms, 2 full bathrooms and covered balcony with an amazing view of the intra-coastal. Close to schools, shopping, and fine dining everywhere and all within walking distance to some of the best restaurants in the area. And the Ocean Avenue bridge is in walking distance from your home with beach access. Open living/dining room combo has sliding glass door which leads out to the covered balcony, kitchen with Formica countertops and ample cabinetry. Dining area is right next to kitchen for convenience when servicing guest and family. Stack bedrooms.